Getting on a plane and cramming into hotel rooms wasn’t the case for Drag’n Thrust at this year’s US Open as we had the privilege to host the tournament in our home town. (Thank you Jake McKean!). The tournament started with a team meeting at Austin & Martha’s place on Wednesday evening. As our coach Jake Henderson laid out his expectations for the weekend, we soaked in the sunlight and were amped up for the four day tournament ahead. One to One comes to the Twin Cities from Columbia, and was a much different team that the Columbian teams we’ve matched up against in the past. As the day started out with little to no wind, we began to make throws and catches, get Ds, and get everyone on the field. This was a big rookie debut for Emily Regan, Sarah Anciaux, Mike Clark, and Jacob Lien, who I have to say proved to play at the Drag’n level. It was a great first game for Drag’n Thrust and One to One, and the game ended 15-9. The game ended with a spirit circle where each team thanked the other for a great game. 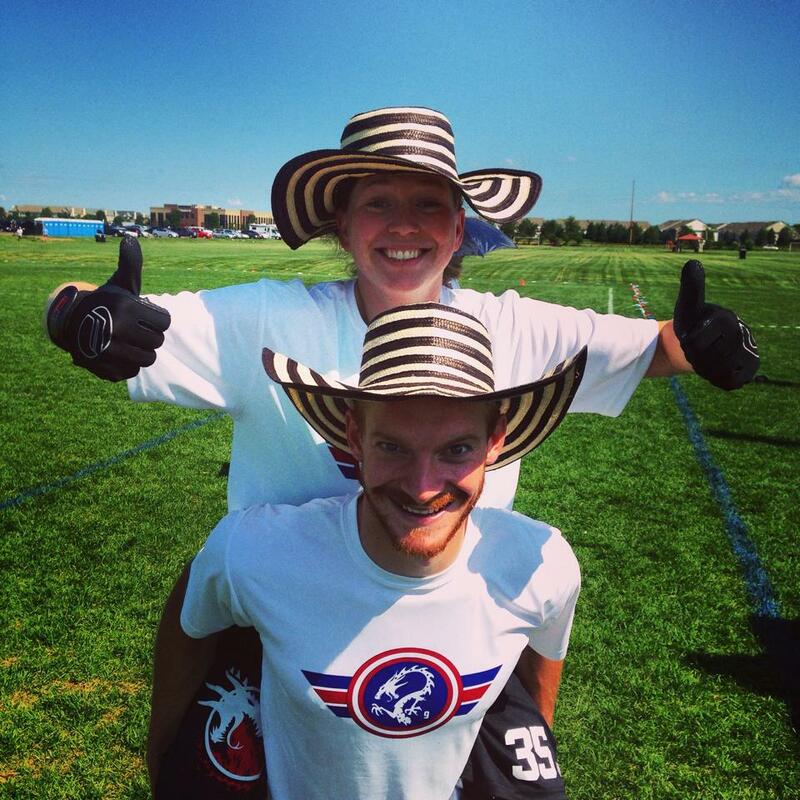 Columbia then rewarded Jay Drescher and Sarah Anciaux with sombreros for making some amazing plays during the game! Having not matched up against Wild Card before, we were coming out hungry for this team to show them what we had. We knew this team was young, and not to be overlooked. They had fought through tough games to get wins and played their hardest every point whether they were up or down. Drag’n went on a hot lead getting the game to 11-6. Wild Card then had a few amazing defensive plays that bring the game around into soft cap, putting the score at 14-11, Drag’n Thrust. Wild Card continued to break us and the hard cap went on, ending the game at 14-13. If it wasn’t for Drag’n’s initial cushion, Wild Card’s defense may have gotten the best of us. Looking back, our games against Wild Card this weekend were easily our two most defensive oriented. They challenged our offense, and gave us something to work on in our upcoming games. We came off a shaky game against Boston’s Wild Card and made sure to get lots of throws and catches in before we began our game against our 2013 Nationals final matchup, the San Francisco Polar Bears. There was a breeze blowing through the field, and we started to basically trade points with Polar Bears up until half. Feeling confident, Drag’n came out of half on a run, eventually beating the Bears 15-9, allowing them only to score two points in the second half. I think our new faces gave them an added challenge on offense and defense as well! We ended the day 3-0 and headed to The Bungalow/Bungalou where Anna, James, and Jacob reside for an evening of grilling, ice baths, and rest. Although the weather seemed to be panning out for the weekend, day two brought higher winds. We got to the fields early and got in a long warm-up for our first game of the day against Philly’s AMP. We knew this team was going to be aggressive and intense. After a few point trades, we started to take control of the game at 9-5. AMP then consistently got breaks to begin retaking points, tying the game at 12-12. On universe point, Drag’n started on offense, just needed to hang on to the disc and score. After a handler – cutter miscommunication, AMP hucks it to the endzone for what was almost a score, but the receiver was just out of bounds. Again, Drag’n calmly works the disc down wind, but can’t keep their hands on the disc and turn it over. With the pressure on, AMP still doesn’t convert, giving the disc back to Drag’n, as Austin finds Tallis in the end zone for a 13-12 victory. Drag’n and Boston’s The Ghosts meet for the first time since an intense 2013 semi-finals matchup. The 2014 US Open Ghosts roster however, would show many different faces. With a few familiar Minnesota pick-ups on their side, Drag’n Thrust had an idea of what to expect. The game kicks off and The Ghosts really turn it on in the wind. Their offense converted many more times than Drag’n Thrust’s offense as they took half with us down 5-8. After Dave Klink’s halftime talk we got our heads together, threw some discs around, and came out ready to make as many defensive plays as needed to win the game. After many breaks, well timed cuts, and patient handler offense, Drag’n pulls out the win 15-11. Our last round was a showcase game commencing at 5:30pm. A four hour break allowed time for us to rehydrate, and check out a few other games. We made our way to the bowl, and got in another long warm-up for our game vs. the Canadian National Champions, Union. The wind seemed to be swirling in every direction, making it hard to have a set game plan for either team. We had not yet played this mixed team from the opposite side of Canada, but knew their men were squirrel-y and their women were twice the size of ours. Nonetheless, we were very focused, making smart catches and throws. We converted after Union turnovers and the game goes our way, 15-6. This entry was posted in Drag'n Digest and tagged Tournament Recap. Bookmark the permalink.